The best tips on losing fat are ones that are sensible and safe. Belly fat on women is discouraging and makes many desperately seek fat loss secrets, fat loss tips, and special tips to lose belly fat. Unlike men, fat on women is tied extensively to emotions. When women feel heavy, they feel undesirable. Discouragement, disappointment in themselves, and depression can soon follow. Women can spend hours searching for the perfect diet to lose belly fat, the perfect fat loss tips article or book, and the one fat loss secret that can make them trim, fit, and beautiful. You can waste money on gym memberships that you stop using, exercise equipment that lies tucked away under your bed, special supplements and even questionable surgery. It doesn't have to be this way any longer. You can have a life without fat, and you can do it with a good workout plan that is sensible, safe, and gets progressive results. When we are discouraged and seeking a magic answer to fat loss, we seem to forget all about the basics that can bring us results. The biggest fat loss secret...is that there is no secret. * Set Small Goals: It is great to have a long-term goal of reducing down four sizes, but you need to make progressive goals along the way. One of the first is to commit to a valid and proven program. * No Sugar Products: Decide now that you will commit to staying away from harmful foods like pastries, sodas, ice cream, and rich desserts. * Eat Four Servings of Fruit Each Day: One of the best things you can do is slice up an apple and eat it, along with a glass of cold water, before your regular meal. This will reduce the amount of food you feel like eating. * Eat Two Servings of Vegetables Each Day: Our grandmothers have been telling us this since we were little. Maybe you do not like to cook, that's fine. Start with cut celery. * Drink More Water: Water helps us flush toxins from our body, it reduces hunger pangs, and it hydrates our skin and muscles...making us look better. Shoot for drinking 8-10 glasses per day...but start with four. One when you wake up, and one at each meal. Start adding others as your system adjusts. Do NOT substitute coffee or diet pop. * Add Physical Activity: Our tips on losing fat would not be complete without a fitness component of movement. Walking to lose fat . To start your fat loss program, we advocate the 2-20 System...which is 2 glasses of water, followed by 20 minutes of walking when you first get up. * Get More Sleep: Scientists have found that poor sleep habits disrupt hormonal levels that make you feel satiated. Since you do not feel full, the effects may result in overeating and weight gain. 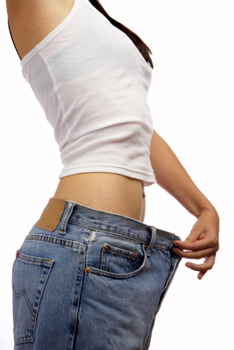 * Know Your Emotional Triggers: Emotional eating is the biggest killer of any diet to lose belly fat. When you feel discouraged, you reach for comfort foods. This may be the toughest thing to overcome. Tom Venuto...author, freelance writer, and natural bodybuilder has one of the finest integrated program to lose belly fat, thigh fat, arm fat...and make those fat losses permanent. His eBook Burn The Fat - Feed The Muscle is perhaps the Internet's all-time bestseller. He has helped thousands of women reach their weight loss goals. Tom does NOT advocate starvation diets, idiotically intense exercise, phony supplements, or dangerous pills. His focus is on a progressive, but complete change in lifestyle approach to better nutrition, physical fitness, and more sleep. His book is not just a compilation of tips on losing fat. It is a step-by-step guide for changing to a better and more beautiful YOU. Tom writes in manner that is straight forward, yet sensitive and validating of the feelings that can overwhelm women. He understands how belly fat on women contributes to feelings of disappointment and discouragement. We advocate his program because it is flexible, doable, and has gotten results for women of all ages. To us, this is the best path to a life without fat.